Having a relaxing day at the beach is a great way to unwind, especially when you take the right accessories with you. Beach chairs are an important aspect in this setting. A good chair will not only help sustain leisure time on the beach, but ease blood flow and tension in the shoulder muscles. Listed below are ten of the best beach chairs available online, chosen for their strong assembly parts, comfortability in the armrests, ease of transport, and the amount of space needed to store when not in use. A detailed review of what each product offers and who it is suited for will help you pick the best chair for your individual taste. The WeJoy chair is colored in sky blue and has a carrying strap that extends out when you need to shoulder it around. The strap goes over one shoulder, and the headrest and pouch included are folded on the outside. Once unfolded, it can be adjusted to recline, sit up, or lie completely horizontal on to the sand. The seat can fit adults of above-average weight (up to 264 pounds) and will inhibit comfort when in the reclined position. While the armrests and material used for sitting are not very strong, it should suffice if you do not handle them too roughly. 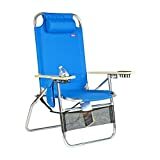 Overall, it is one of the best beach chairs for those not expecting multiple uses from people with variance in size, so as not to bend the reclining bars. The GCI Waterside chair has the advantage of being fitted with a large canopy, which goes above the user and can be adjusted backward or forwards. The shape is identical to a classic lawn chair that is angled at approximately 120 degrees when in the normal position. If you are carrying small items with you on the way to the beach, you can use the storage bag and convert it into a pillow when the contents are emptied. Although the bars are strong and can withstand weights of up to 250 pounds, the mechanism to adjust the positions is difficult to move in the sand, particularly when sitting in the chair, as full pressure is brought on the legs. The weight of the chair itself is also quite heavy at 15 pounds. Rio Beach makes numerous accessories and mobile furniture for beach lounging. 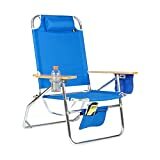 The Lace-Up folding chair is easy to carry, lightweight, and equipped with four reclining postures. During storage, it can fit into spaces that are confined, even under some car seats. The Lace-Up’s design is also unique. It resembles a hammock in some ways, since the body’s weight is entirely supported by laces that are tied to the frame. There are 20 ties in all, so it should not break if the weight capacity is not ignored (240 pounds). Folding can be a chore when you’re ready to go. The easiest way is to simply turn it upside down and firmly press on the top and lower seat portions until they cannot be moved further. 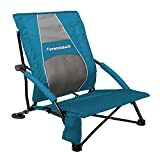 The Strongback Low Gravity combines the sleek design of a camping chair with the portability of standard outside recliners. Since it rests low to the ground, your legs can stretch without resistance at the bottom seat portion. The back is similar to a mesh office chair, slightly extending into the middle back portion of the body. This will allow you to maintain an ergonomic posture that is great for reading, making it one of the best beach chairs for bookworms. One potential downside is the height of the chair itself, which could cause difficulty in those who have problems getting up when lying too close to the ground. Furthermore, the crossbars situated on the side can impede circulation to the legs in heavier individuals. If you plan on sitting for long periods on the beach, the Copa Beach brand is designed for you. The build is one of the most impressive seen in all beach chairs found online. The frame is made entirely of aluminum, and it extends to 17 inches from the ground. The handlebars are carved from real wood, and feature a suspended cup holder on the right. Larger items can be placed in the pouch that is latched to the recliner. This is one of the best beach chairs suggested for heavy individuals. The 300-pound weight capacity and 20-inch seating width ensure that breaks are unlikely to occur. Keep in mind that no height adjustments are available with the Big Papa. Rio also makes beach chairs that are suitable for those who are tall. The Hi-Boy Chair has three bright color choices of lime green, turquoise, and multi. A drink cup and pocket on the sides are made of the same fabric that binds the chair. The armrests are wooden and adjust to a perpendicular alignment to the frame when folded in. The chair can extend to seven positions, but will not recline flat. The only con is the difficulty in transport, since the back is high and adds weight to the strap, causing strain in the shoulders when towing for long distances. The Big Jumbo heavy duty chair, as its name implies, can carry up to 500 pounds of weight without bending or snapping. 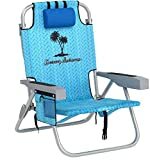 The overall height is 42 inches, so consider this as one of the best beach chairs if you or someone you know is well above height and weight averages. There are many pockets throughout the body, with one located directly underneath the seat, making it easier to store heavier objects. A notable downside is the armrests, which are carved from wood. During use, they may slide back down to the default position with little effort. This is especially an annoyance when the chair is extended at a recline. 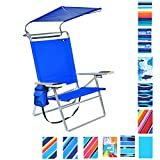 In some cases, the main selling point for a beach chair is the inclusion of a canopy, which is not an attribute of all products in the category. The BeachMall Deluxe 4 takes many of the design features of different lounge chairs and combines them into a lightweight product that incorporates a shade that extends according to the sitter’s preference of adjustment. The pouch on the right side of the wooden armrest is waterproof, with a translucent sleeve that will allow you to control your smartphone when secured inside the pocket. Its material is polyester and won’t tear when used under its capacity, which is 250 pounds. Due to the wide canopy, it is bulky, exceedingly so when hauling over a long range. Nautica is known for producing high-quality clothing, but has extended their range of products to beach accessories, including chairs. This model is visually impressive and available in three distinct colors of mint, red, and rainbow. The best features are the large side pockets on the left and right of the armrests, big enough to store large bottles of water and small towels. The five position recline allows the backrest to lie completely flat, making tanning easy if you dislike lying on the sand. 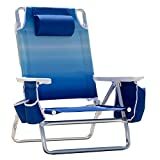 Manufactured with a 300-pound weight capacity, the Nautica beach chair is well suited for big and small beachgoers. The seat back is 22 inches and has a headrest on the top. There are no pockets for holding cups or other items on the armrests, a minor inconvenience if you enjoy drinking beverages while on the beach. The Tommy Bahama backpack chair excels in two regards. The first is mobility, with the chair being shaped in a way that doubles as a backpack. It has two shoulder straps that go over both arms, along with large pockets on the back recliner. This provides permanent storage space for items during the entirety of the chair’s use while away from home. The second is comfort, due to a polyester woven in wicker design that keeps the body cool, even when not under a beach umbrella. The frame is strong and won’t break easily, yet has some drawbacks. When the seat is reclined flat, the middle and lower bars can lead to discomfort in the legs and lower back, particularly for heavy users. The best beach chairs on the market have many useful features incorporated into their design. When you have narrowed down your choice to the products that interest you the most, remember the attributes detailed above, as they will allow you to find the right chair for increased comfort on the sand. If you know of other best beach chairs that weren’t mentioned in this list, leave us a comment below.